This weekend, I made my first pilgrimage to Bulk Buying Paradise: Costco. I’ve never been one to buy in bulk mostly because I’ve lived in small spaces with few other people, and also typically the foods I like to eat aren’t typically sold in big box stores. I like to buy as small and as local as I can (which is why my produce in the summer comes from my CSA). However, probably like many of you, I saw my grocery bill shoot up in January because of all the healthy eating I was doing! So I decided to revisit Costco and see what had changed on the shelves. My dad has a membership, so we made a Saturday morning trip there together. This was the Saturday before the Superbowl, so probably the absolute worst day to go there between people stocking up on food for Superbowl parties and people buying new TVs. Even though we spent 90 minutes in the store (!!! ), I didn’t get to see every section, so I’ll likely update this post in a few weeks when we make a return visit. Everything in this post was seen or purchased at the South Loop location of Costco in Chicago in February 2019. I have no idea what your store will have available, but this is what I found. I’ve read that the author of Salt, Fat, Acid, Heat (one of my top cookbook picks) loves this olive oil so I figured its worth a try! Also this particular extra virgin olive oil was one of the few major brands that passed UC Davis’ sensory defects test a few years ago. Sensory defects are indicators that the olive oils are oxidized, poor quality, or possibly cut with cheaper reﬁned oils. I always keep a second, nicer extra virgin olive oil for salads and drizzling. For the past couple years that has been one that I picked up while in Italy or Greece or—I know I’m so lucky saying this—a bottle from my brother-in-law’s family olive oil estate in Greece: Pylian Estates. The Kirkland olive oil will be great for everyday use and cooking (low heat only!). Admittedly these crackers are THE reason I decided to make this trip to Costco. I love these crackers probably way more than I should. Typically I pay around $5 for 4.5 ounces so you can see why this deal got me excited. The only downside is that they are only available in the Sea Salt flavor, but I like that one so I was happy. These crackers are perfect with Mushroom Walnut Pate or almost any dip! If you are not a fan of Simple Mills, Costco also had Mary’s Gone Crackers for a healthier cracker option. Again, here’s another product I probably spend way too much on! GT’s is one of my favorite kombucha brands because the flavors are on point and the sugar level is not too high (plus there are no added artificial sweeteners). My Costco only had Gingerade flavor, but that’s one of my favorites so I was happy. Kombucha does need to be stored in the fridge because it’s a living, probiotic food, but this package was only 6 bottles so it’s not too bad. They’ll last for 1-2 months. Costco also had Suja brand kombucha, although I’ve never tried it. The only other beverages that I saw that I would potentially buy were San Pellegrino (both glass bottles and plastic) and Spindrift Sparkling Waters (30 12-ounce cans for $14.99). Nuts, seeds, and dried fruit might be the best deal at Costco if you are typically buying those items at a grocery store. In Chicago, I’m never able to buy small-produced or locally grown nuts and seeds so even if I’m at Whole Foods, I’m still buying big national brands. Watch out for the mixed and seasoned nuts though—many of them are fried in cheap oils. 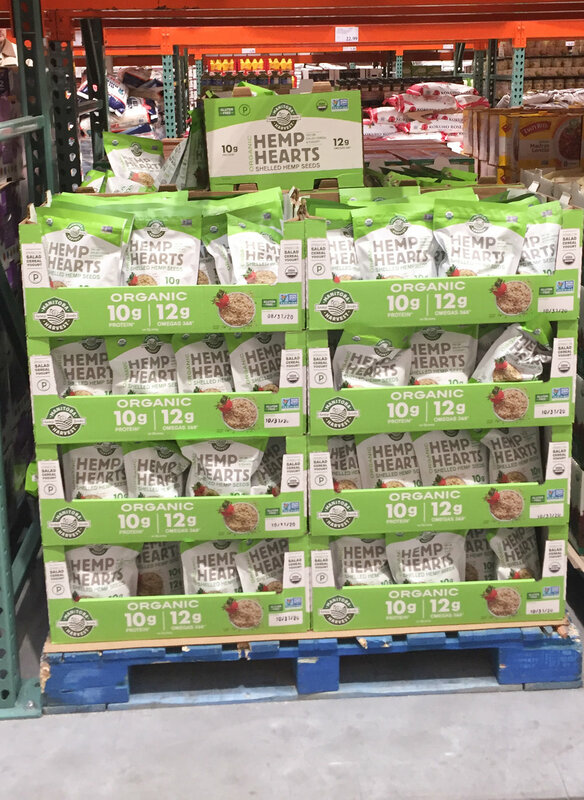 On my visit, Costco had Organic Hemp Seeds (1.5 lbs for $13.99), Organic Chia Seeds (2.5 lbs for $6.89), nuts like pistachios (24 ounces for $13.99), and dried fruit like dried blueberries (20 ounces for $12.99). If you stock up on frozen fruit for smoothies, breakfasts, or desserts, Costco also has some great deals. I’ve been buying a lot of frozen cherries lately and typically I’m paying around $5/lb for dark sweet cherries. On this trip I saw a 4lb bag of mixed cherries for $8.99. They also had mixed berries and a few other kinds of fruit. The frozen products are a great deal and have a long shelf life, but remember you need the freezer space! Most of what Costco sells does seem to be processed, seasoned foods, but I did see plenty of pantry items like tomato paste (12 6-ounce cans for $5.99), Banza Chickpea Pasta (5 8-ounce bags for $8.79), kalamata olives (52.9 ounces for $6.99), Lotus Foods Rice Ramen—what I use for my Instant Ramen Jars—(1.875 lbs for $7.99), and Wild Planet Albacore Tuna (6 5-ounce cans for $14.99). I wasn’t looking to stock up on any of these items that day, but I did take note for the future. So first, the good! I actually found a lot of things that I would buy (not just could buy) during this Costco trip. Especially in terms of mass-produce organic goods (like the olive oil) or big health food brands (like Lara Bars), I could see how I could really save a lot of money and be getting the equivalent of what I would buy at a regular grocery store. I also found that for many items, I didn’t need to buy such a huge amount. 6 cans of tuna or 6 bottles of kombucha is a totally reasonable amount. Although Costco is not as close as my regular grocery stores, it was really not that far out of the way and had ample parking. It was also a fun family adventure—I definitely felt like I was in some sort of museum exhibit. Tourists to America should definitely all come to Costco! There were definitely the expected downsides like having to buy in large quantities, an unattractive store, long shopping time, and an out of the way location. But the biggest downside I can see to shopping at Costco is that I really do think that the model encourages you to buy more than you need. Or even to buy different products than you actually want. I felt myself thinking many times, oh I could use these 12 tubes of toothpaste even though it’s not the kind I like! I think having paid a membership fee would lead a lot of people to the “sunk cost fallacy” where you try to justify the money you’ve already spent by counterintuitively spending more. The store size and cumbersome nature of shlepping a giant cart around also turned a typical 20-30 minute trip to a grocery store into a 90 minute saga. Also—despite the fact that I spent nearly an entire morning at Costco—I never actually saw any fresh food, despite hearing that they do carry it. That’s the main reason i need to do a follow up to this post! I think the store was just so big and we were there for so long that my dad and I basically gave up at a certain point just because we wanted to go home. So what’s my final verdict? I actually do think I’ll be making maybe a quarterly trip to Costco with my dad, because that’s about all he and I can handle. I think for pantry staples and my snack foods, it actually represents a great deal for not too much hassle. My Costco mantra will be to only purchase items and brands I would be purchasing anyway, otherwise I can see myself spending even more money food shopping. One more Costco tip for you: they publish monthly deals that usually take off a significant portion of the price. That seems like the way to really save on items if you can make sure you aren’t tempted to buy things that you don’t actually need. Is there a way to shop without being a member? What do you think about Costco? Any tips or must-buy products? Share in the comments below!